Huacachina: Seize a Wild Ride in Peru's Oasis — Sapphire & Elm Travel Co.
On top of that hill, sand dunes as far as the eye can see, I leaped on my board head-first – racing a friend down the mountain. It’s easy to mistake Huacachina, Peru for the Saharan desert with its’ expansive dunes, heat intensified by the reflection of the sun on the sand, an ethereal haze where the sky meets earth. Huacachina is a tiny village built around an oasis, surrounded by sand dunes in one of the hottest and driest places in Peru. People come from far and wide to board down these sand dunes. The thrilling sandboarding adventure starts long before you hop on your board, as your buggy driver turns the ride into a roller coaster. The buggies speed off, leaving behind a cloud of dust as the patrons cheer and hoot with delight. Every rider has the option of boarding on feet, belly or bum. The first run is considered a test run as it’s the smallest at around 10 meters (32 feet) high. I tested my limited boarding skills on my feet first, failed miserably and hilariously, and decided boarding on my belly was best moving forward – so I could get some speed. Each run we went on was increasingly higher and more unique – curving to the left, or two hills combined into one eventually working up to greater and great heights, the guides saying runs can reach 100 meters (330 feet) tall! Each run and buggy ride in between was an absolute thrill! 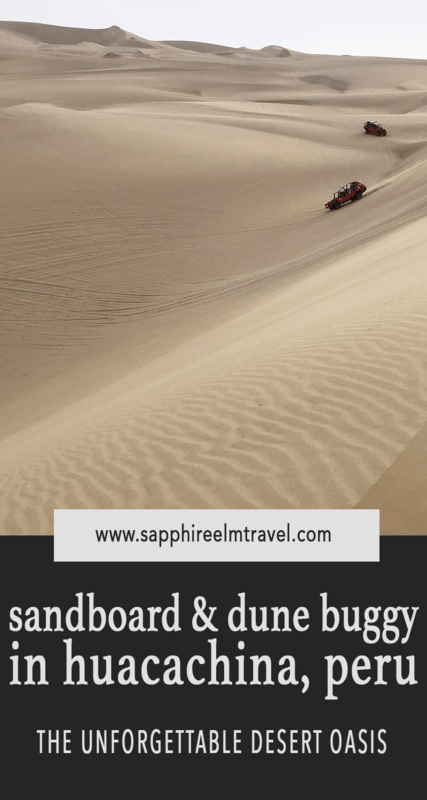 Sand Dune and Buggy Tours are offered a couple of times a day, but the 4 pm tour is the most recommended as the heat is subsiding so it lasts two hours instead of one. Half of which you are flying through the dunes in the buggy taking you to a variety of “slopes”, with fewer and fewer groups around. It was honestly hard to decipher which part of the tour I enjoyed most, the buggy ride or boarding down the sand dunes! The end of the tour ends with a picturesque sunset of the dunes and an incredible view of the oasis. A primitive town, Huacachina has just a few restaurants and resorts centered on a handful of streets. However, the volume of construction alludes to upcoming boom in tourism to this unique destination in an already popular country, especially after Huacachina made an appearance in one of the final episodes of the Bachelor. Here you’ll spend the day lounging by the pool (after three days hiking the Colca Canyon this sounded iseal! ), sipping Pisco, gazing upon the massive sand mountains, walking around town, or renting a boat to paddle out in the lagoon. Make sure to catch a sunrise or set on top, it’s magic. If you’re craving a workout, there’s nothing better than running up and down these monumental sand dunes! With Ica – a major hub of Pisco production nearby, Huacachina is an adventure waiting to be had. Are you ready to experience Peru for yourself? Going to a country for the first time can produce its’ own set of challenges. What should you do, how should you prioritize your valuable time, what can you realistically fit in based on times of activities, the size of the town or city, the distance between locations, etc. We have been to Peru; we have walked the streets, seen the sights, and experienced the activities. We know from first-hand experiences what to do, how long things take and the best way(s) to get around. More importantly, we know how to optimize every experience so you make the absolute most out of every single day of your vacation. Sapphire & Elm creates custom travel planning uniquely crafted for you with a stress-free experience from booking to your return home.